earth and ashes, given time. The simple joys of home: a bunch of daffodils, a bowl of hyacinths, blue and white pottery, candlelight and starlight, all can lift the spirits without expense. Today I have chosen one of mine, previously unpublished, because it goes so well with this photo and Maureen’s hyacinths, and Brian Johnstone’s meditative poem rounds off beautifully. I count the pots, 1 2 3 4 5. The moon a half golden bracelet. The sky cluttered with stars. All is still, no cars, no trains. This is the still time of year. melting back into the atmosphere. unnatural, forced from the bulb too soon. The new year’s bombs lie undetonated. This is the still time of night. this time to nurture them. as fowl. The table waits below. conversing, raising up a glass. Today’s photo is by Sally Evans, of the first spring flowers in her garden in Scotland. It has inspired today’s aspect. In winter, while enjoying the warmth indoors, planning for spring, such as what vegetable seeds to plant for the allotment, and observing early spring flowers, leads us to gently anticipate the joys to come, while still living in the now. Likewise, as in one of these poems, memories of the previous summer keep us warm, and in some cases preserved in wine, jams and honey, keep us well fed too. vibrant lobelia blue, rose pink. and the black cat rolls in rapture on the path. to spread on winter days. of Vouvray? That tingle? A little bit of bite? of energy from every stretching stem. the lawn, how your steps compress it. switches on and off – cloud shutters. What is eloquent is the passing moment and the moment that will come after it. to crystal, hazing the line of the hills. counting, they’re filing the season away. Today it’s all about food, and it won’t be the only one with that angle! Home-made food is all about being cosy, sharing, and being in the present moment. Pungent baking smells fill the house. Three loaves cool on wire racks. speckled with oval sunflower sections. A happy sigh ; the family is home. Stone-ground grains ; wheat, barley, rye. Pat flour off my apron’s belly, into my hair. The oven clicks, starts its rise with the bread. Stretch apart on the swelling surface. their acts, their thoughts are mine. Today, the salmon glows deep red. I stoop, protect the modest light. out, to placate the dead. Brian and I reading our Dr Who poems. Featuring: Brian Johnstone, Andrew Philip, Sally Evans, Jo Bell, Julie Boden, Carolyn Richardson, Charlie Jordan, Andrew McMillan and Angela Topping. Having taken part in two Split Screen readings so far, one at Norwich with George Szirtes, Helen Ivory, Martin Figura and Andy Jackson, the editor, and one at Callander Poetry Festival with Andrew Philip, Carolyn Richardson, Sheila Templeton, Sally Evans, who performed Yoda with props, in a never-to-be forgotten paper hat, and others, I was greatly looking forward to the Manchester event. Each one has been special in its own way, as different contributors have attended each time, and Andy gives us the chance to choose poems we enjoy reading in addition to our own, to make for a varied show. The poems in the anthology, from Red Squirrel Press, are placed in juxtaposition, with, for example, Marilyn Monroe opposite Doris Day; Max Miller V Ken Dodd; Pete and Dud, Kirk and Picard. The Manchester launch was special to me because it was the first time my Dr Who poem on Jon Pertwee had been performed back to back with Brian Johnstone’s Tom Baker one. It’s been rare at performances that both of the poets are there. Each event is chaired by Andy Jackson, the editor, who came up with the quirky idea in the first place and who puts together a workable running order and a slideshow of the relevant characters and shows. All this helps the show to be slick. Andy creates the illusion of an evening’s TV watching at some point in the past, with adverts in the middle and a poem about closedown and the white dot at the end. 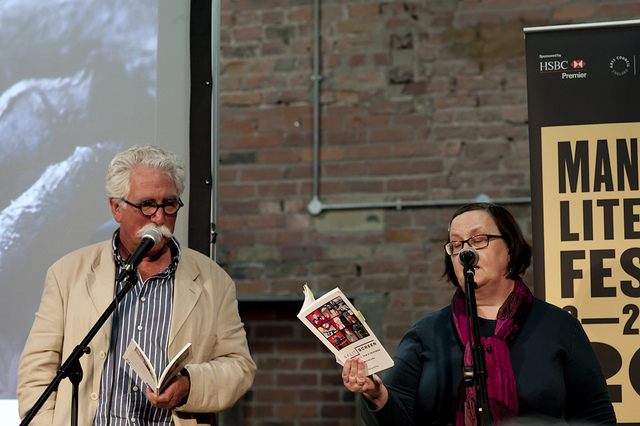 These poems have been performed at every launch, but at both Callander and Manchester, we were lucky enough to have both their authors, Sally Evans and Andrew Philip, there to read them. Ian Parks’ ‘Flake’ poem and Adam Horovitz’ ‘Orange poem’ have been chosen at most of the launches, to be read by others. After the ‘9pm watershed’ the poems are more hard hitting, less ‘family’ than the ones before the ads. And the show ends with The National Anthem, which we all stand for with great solemnity, only to be treated to a surprise which I wouldn’t want to reveal here: its delight lies in the unexpected. The poems are wide ranging. Some are hilarious, some moving, some reflective. The standard of performance has been top notch at every event. This anthology reaches a wide audience as the programmes and films included are ones that transcend age and generation, and have in many cases become cult viewing. The poets offer new slants on familiar things and a second book is in the offing. I’ve been delighted and humbled to be involved in this project and there are more events to look forward to in the series. Glasgow, Newcastle and Pitlochry are coming up fast. If you can’t get to the show then at least you can read the poems, if you buy the book.